Goalsystem Fantasy (GSF) is a complete fantasy skirmish system designed for 28mm miniatures play. It features the basics of combat, movement, and character creation. The game also includes rules for magic and scenarios. GSF is powered by the Goalsystem, the same rules that run SuperSystem and Chaos In Cairo. If you have never tried a Goalsystem game, this is a great way to do it. All you need are 3-5 figures per side, and a handful of six-sided dice. Color cover and fifteen pages. Richard smith 7 9 8 Excellent rules which allow you to play small skirmishes, but mildly disappointed that it is not a full book, merely the rules from Terronus, Isle of Goblins. Still well worth a look though as the rules are good! patrick clapham 10 8 9 A few months ago I was statting up elves and dwarves with the Supersystem. Now I don't have to! 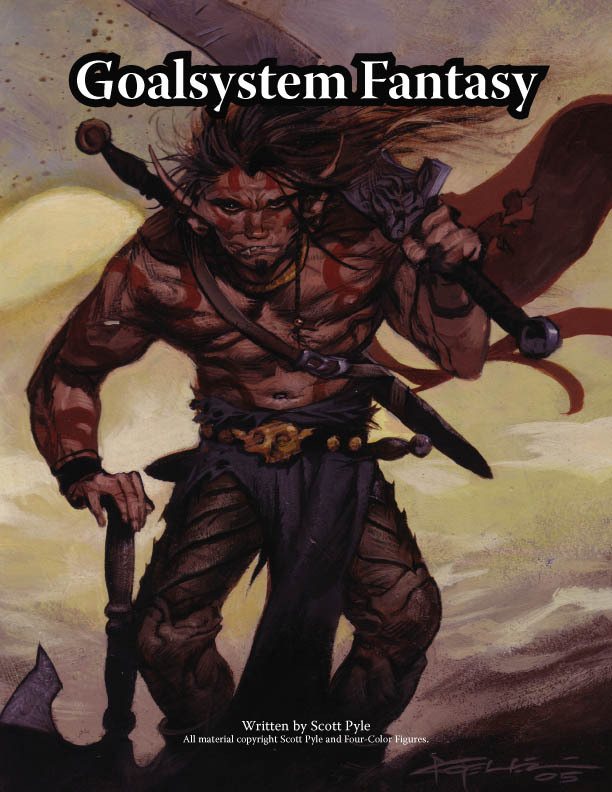 Robert Cook 8 7 8 Goalsystem fantasy is a nice system for small fantasy skirmishes. Ronald Pehr 9 6 8 A worthy addition to this company's clever, playable house system. jason glassbrenner 10 5 6 Solid rules, but the build system isn't varied enough to compliment most miniatures collections. Robert Luhrman 10 10 10 Takes the Goal system to the fantasy realm. It's a great system that can be adapted to any genre easily. Nice that it's now in Fantasy too. Michael Schroeder 10 10 10 In my opinion, the GoalSystem is the best universal skirmish system I have ever come across. Very easy to adapt to any system. GoalSystem Fantasy is just another fine example of the flexibility of this rules sytem. Ted Conn 10 9 9 This is a straightforward, easy wargaming system. Those familiar with SuperSystem will find these rules to be very easy to play. Goalsystem captures the essence of small group conflicts (3-4 per player) with a minimum of paperwork and prep time.